Kozel Zahradníkem. Part of puzzling’s deep roots in the Czech Republic. I’ve been a busy boy these past two weeks - two PuzzleMad guest submittals without a three-month gap! (Ed - yay!!!) That has to be some kind of personal record. This article was actually in the work and almost complete when it was preempted by the lovely No. 360. We return now to the vintage world but with an international flavour (Ed - aaaargh - American spelling removed!) this time. Unfortunately, there were some severe language issues researching this puzzle, so I wasn’t able to find out as much as I’d like. Be prepared for unfounded assumptions and rampant speculation (Ed - oooh my favourite!). Czech readers in particular, please feel free to correct anything and everything in this post. Today’s feature puzzle is Kozel Zahradníkem, or in English, Goat Gardner. 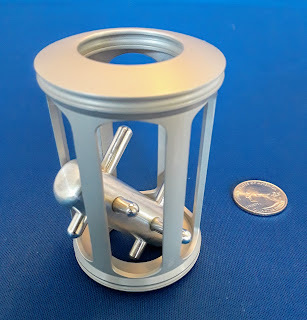 It’s a little-known puzzle from late 20th century, probably the 1960s or 70s, or even the early 80s perhaps. It’s hard to tell with second-wave plastic puzzles. You might deduce from the name that it is Czech, and you’d be right. 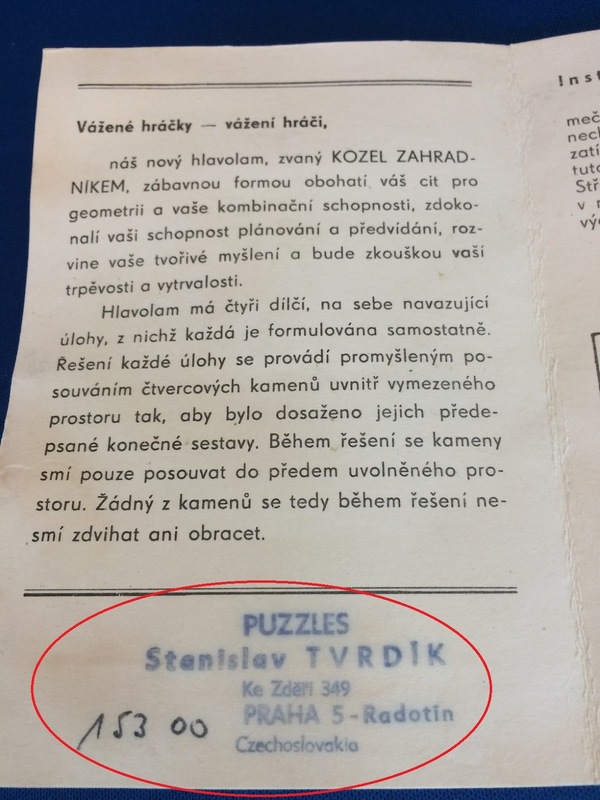 Although this puzzle was clearly mass-produced, my cursory internet search indicates that it never reached a broader market outside what was then Czechoslovakia. Perhaps you can guess why, given the dates involved. Before we get into the mechanics of Kozel Zahradníkem, let’s take a moment to acknowledge antecedents. 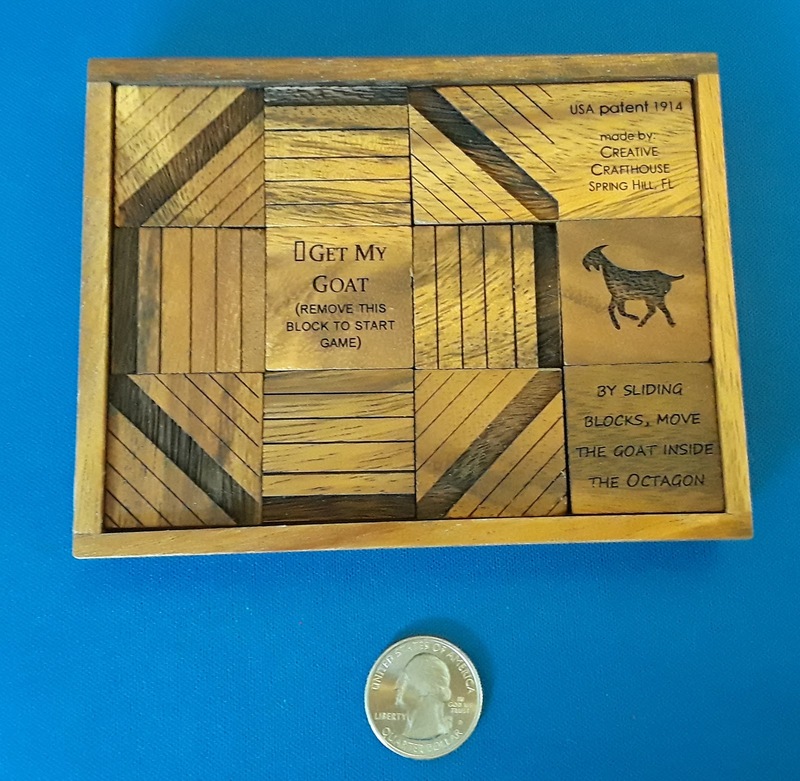 Serious puzzlers will immediately recognize the goat theme and the overall structure of the puzzle from the early nineteenth century Get my Goat. Get my Goat is a true classic among sliders (yes, I know I say that a lot). It was patented [link PDF] in the US by John I Wiley way back on October 6, 1914. Other-themed versions were produced in accordance with the spirit of the times, such as “Katch the Kaiser” (under Wiley’s patent) and “Kapture the Kronz Prinz” (in the UK with patent applied for). Examples of these can be seen at Jim Storer’s excellent and very helpful site. The same basic puzzle was again pressed into service during World War II as “Put Hitler in the Dog House.” I’m not sure if this counts as war profiteering or patriotism. Probably a measure of both, as is often the case. Although the later versions are historically interesting, the inventor’s original concept was the charming and playful Get my Goat, so let’s stick with that. Back-of-cover instructions, for the record. A nice reproduction by Creative Crafthouse. Comes with handy cover. Detail of original Get my Goat cover art. The goat has the high ground, as usual. I confess, Get my Goat gave me trouble (Ed - me too - I have the wooden version). According to Wiley’s solution, there are 31 steps. Edward Hordern was able to cut that a little to 28. I’m sure I was double that by the time I captured the goat. You know how it is with these sliders, once things start to go awry, all bets are off. You can circle around for a long time just making things worse and worse. If you are persistent enough (or for some, smart enough), you eventually begin to clean up the board and feel your way to the solution. If you do the puzzle a few more times, you might start to see patterns and visualize at least some of the solution. That’s my experience at least. Fortunately, you don’t need to comb auction sites to find Get my Goat. Dave Janelle at Creative Crafthouse has reproduced the puzzle in a very nice hardwood edition. Those guys have really good taste in puzzles. Their craftsmanship is solid and the pricing can’t be beaten. After you have finished ingesting the weekend puzzle blogs, you should go get yourself a copy. Its required in any collection. An image of the outer packaging, courtesy of www.hlavolamy-puzzles.cz. My copy, unfortunately, came without it, courtesy of some dude on eBay. 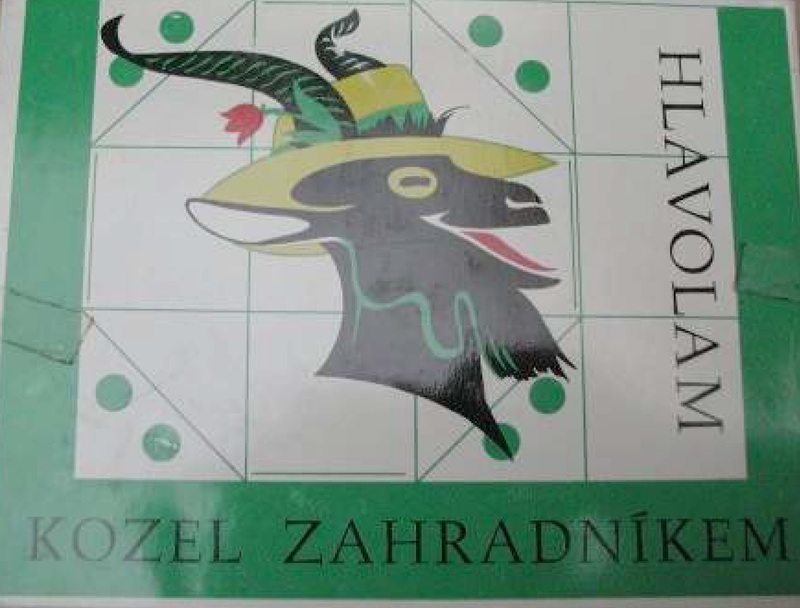 Now that we have some context, let’s get back to Kozel Zahradníkem, Goat Gardner. This take on the classic does not utilize the upper left rectangular piece which is so critical to Get my Goat. Rather, it is composed of 11 equal-sized squares. The Czech puzzle is not the only variant to use this layout. 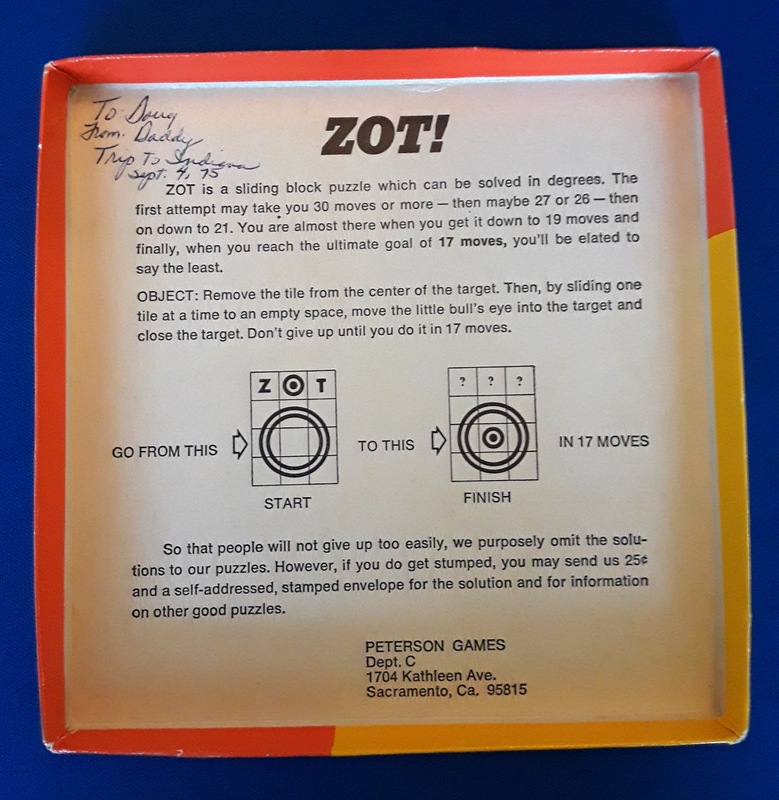 Turning again to Jim’s page, we can see a number of similar puzzles such as Bullseye and ZOT!. The idea of splitting out that rectangular piece dates back at least to 1942 when it was illustrated in Anthony Filipiak’s Mathematical Puzzles and other Brain Twisters. Using this layout, the minimum solution path is 17 moves (according to Hordern’s analysis and the ZOT! packaging). I can personally attest that it’s a lot easier than Get my Goat! Hordern believes this simpler version may have originated as an erroneous attempt to copy Get my Goat. Sounds plausible. ZOT! from Peterson Games. Exclamation points make puzzles more fun. ZOT! rules of play, although I’m sure the readership can figure it out. Using all square blocks is indeed a very significant deviation from the original design. Does that mean Goat Gardner is just a watered-down Get my Goat (like ZOT!)? Absolutely not. 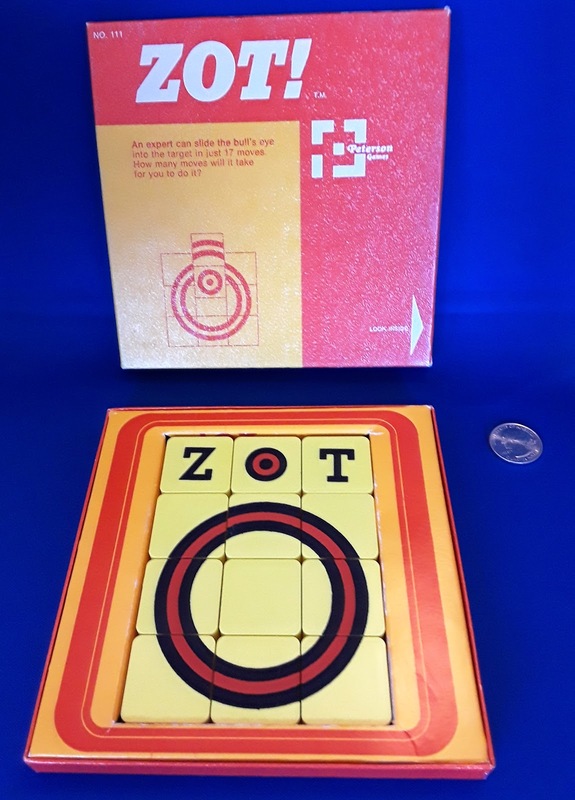 With one relatively simple design innovation, Goat Gardner transforms the nigh trivial bullseye structure into a multi-challenge puzzle with progressively more difficult layout objectives. The key innovation is the inclusion of two dots on each of the four corner pieces. These are painted green, as you can see in the photos. Or they should be at least; the paint tends to flake off easily. 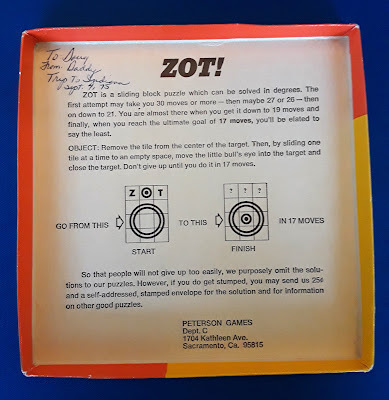 The first challenge is basically the bullseye-ZOT! challenge: get the goat into the centre and replace all fences. The literature gives a 24-move solution, but we now know that it can be done in 17. When solved, you will quickly see that this is not an ideal place for a goat (unless you are the goat). So the next challenge is to remedy the situation by moving the cabbages outside the fence. This means moving the upper right fence to the lower left and the upper left to the lower right (and vice-versa), then returning the goat to the centre. 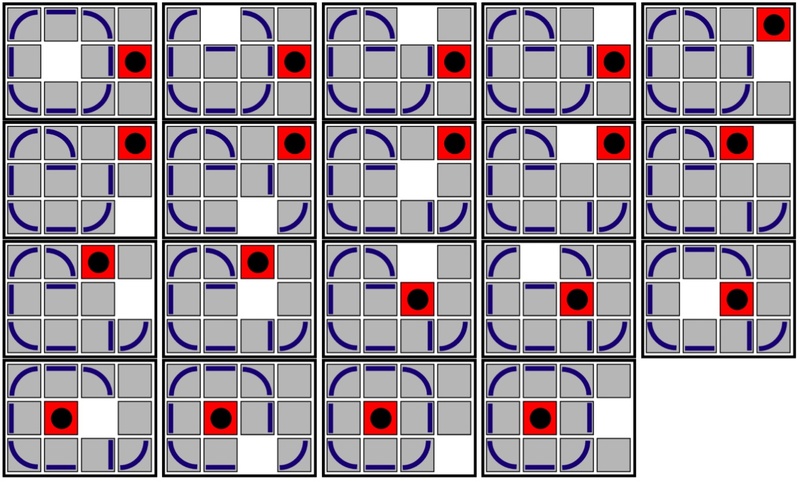 The literature gives a 40-move solution for this. I’ll take their word for it. Challenge 1: same as ZOT! Challenge 2: cabbages safely outside. The goat, now feeling utterly cheated, becomes angry and charges the fence. The fence starts to give, so the farmer decides to fence the goat more closely so that he cannot run. For the third challenge, then, you must reverse the upper-lower and left-right fences to make a small box around the goat. This should take you at least 33 moves. Challenge 3: fenced in tightly. Finally, if you are up for it, you can return the puzzle from the end of challenge 4 back to its original starting position. The literature presents this as kind of an informal challenge, without a solution. Challenge 4: cabbages for dinner. I enjoyed the whole process and found Goat Gardner delightful to play. It was reasonably challenging, but not overly so. In fact, I didn’t notice a massive difference in the solving difficulty between challenges. This is probably because I took much more time than was necessary on the easy problems and then managed to be reasonably efficient on the hard ones. It all seemed to average out. Because of the bullseye “all-square” design, there were no major time-consuming hang-ups. You just need to keep your objective in mind and, to a certain extent at least, have a rough plan of action before you start moving things around. Overall, I would say it is a very enjoyable, low-stress puzzle, suitable for all ages and skill levels. (Ed - MUCH too difficult for me!) Veteran solvers will doubtless make short work of it. Slider specialists might find it too easy. But if you are a sliding block fanatic like my good friend Amanda, you need to find a copy. Considering they are not terribly old and are cheaply constructed, prices should be reasonable. You’ll have more luck searching European sources. I don’t know how many ever left the Czech Republic, but it can’t have been that many. Happy hunting! Solution pathways provided with Kozel Zahradníkem. Possibly not the shortest, but fully functional. Before we wrap up, I want to point out one final interesting aspect of this puzzle, and why my copy is dear to me. I didn’t realize until after I purchased and played with it, but my copy’s literature bears an important stamp on the first page. 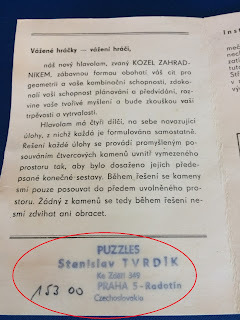 It is the name and address of the great Czech puzzle designer and collector Stanislav Tvrdik. Veteran puzzlers will recall his best-known design, the Ježival style hedgehog-in-a-cage, dating to 1966. It was the biggest advance on the classic hedgehog since its introduction around 1886. Although I spend an inordinate amount of time on this hobby, I remain woefully deficient in many international aspects. Luckily I recalled Mr Tvrdik from Radek Micopulos’ description of his excellent 2015 Ježival reproduction which, as fate would have it, I had recently purchased. Ježival, produced by Radek Micopulos. Get one! Radek gives a great history of the hedgehog puzzle on his website; it's required reading (Ed - use Google Chrome and it will offer to translate it into English - Fab!). If you wander around the site enough, you will eventually encounter a sobering and crushing update from Radek. 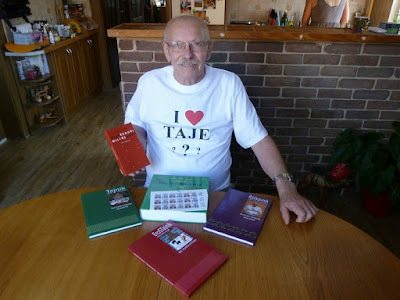 Stanislav Tvrdik passed away in late February of this year (Ed - yes I heard about this on FB when it happened - very very sad). Yet another great puzzle personage gone. If you are looking for information on Mr Tvrdik, you won’t find very much, in English at least. Perhaps the best you can do is watch this Youtube video. Most of us won’t know what he is saying, but it is interesting nevertheless, and one is rewarded with a small glimpse of his collection. Naturally, I am now extremely curious to know if Goat Gardner is a Tvrdik design. I searched and searched but could not find an answer to this. I asked Radek about it, being the only Czech I know, and he was not familiar with the puzzle nor who had invented it. I certainly would like to think it was Mr Tvrdik’s. We do know that he took the classic hedgehog, a very old puzzle, and updated it with a clever new design. Goat Gardner, very similarly, is an ingenious new take on a classic sliding puzzle. They both likely date to the late mid-century period, a period during which Mr Tvrdik was known to be quite productive. I think the circumstantial evidence leans to the positive, but I’ll leave it to our friends in the Eastern European community to resolve. Either way, it is a great puzzle to have and I treasure it as much as my artisanal puzzles, perhaps more. Wow! Wow! Wow! What a fantastic article you have written there for us! Tremendous work and research has gone into it, I am almost ashamed of my own posts now and am wondering whether I should just hand the site over to you permanently? I'll need to buck up my ideas and produce better quality articles in the future! Thank you so much for helping me out again...I really appreciate it! If anyone else would like to have an article published then please use my Contact page to get hold of me and we can discuss it. I have been contacted by a few professional web writers over the last few months and would like to discourage them - I really want well-informed articles and opinions from genuine puzzlers and not something generic. Enjoy the rest of your weekend guys - see you again in a week. Bite your tongue! You know i would run this great blog straight into the ground if given tbe opportunity. It requires a Sadler at the helm!